How do I manage enrollments using the Teacher app. How do I manage enrollments using the Admin app. 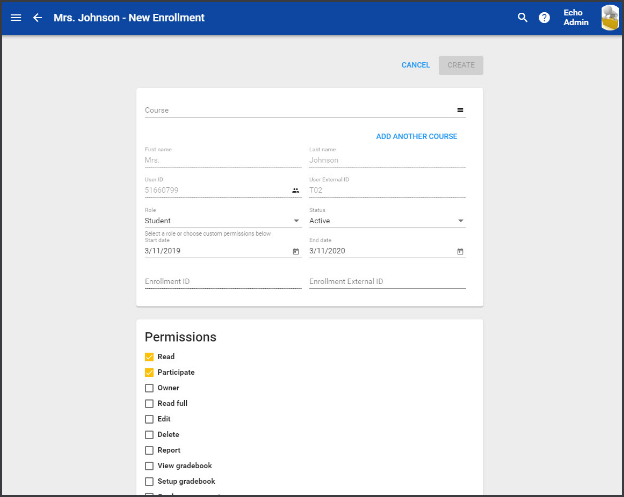 Managing enrollments with Admin app. A user's enrollment allows them access to a course for a specified period of time. Once the enrollment has reached its end date, the enrollment expires. Use the bulk update feature to update multiple enrollments in a course. The course name or ID to search the current domain (required); to broaden your search, check the Search all domains box. A Start Date and an End Date for the enrollment. Note: If a user is unable to find a course, most likely their enrollment end date has passed. This means they are no longer enrolled in the course and it has been removed from their homepage. A course's end date is unrelated to a user's enrollment start/end date in a course. By default, a user's enrollment end date is set to the course end date when they are initially enrolled. From the Course detail page, select Enrollments tab. Select the Enrollment ID of the user that needs to be changed. You can use this screen to manage and import enrollments. To add observers to an enrollment, click the Enrollment ID. Teachers are able to manage enrollments in their course, providing they have the appropriate permissions to do so. To add enrollments to a course please see the link provided under Additional articles. If the course has a Master Course, Echo lets you choose to make changes to either the Master or to the course you're working in. Enrollment are not inherited from the Master Courses, nor are students generally enrolled. Find the users(s) you want to drop and check the box next to their name(s).